Since thier first fall here in Burlington, Melissa has heard rumors of mythical, magical donuts prepared by a particular, deep-rooted, Burlington family. These home-made, legendary, donuts are most commonly available on All Hallows Eve. However, for the Harrington's, being well over trick-or-treating age, without any children in their care AND having to manage a bar...there have been few opportunities to seek out these highly acclaimed morsels. This year, the third Halloween of Mike and Melissa being present in Burlington passed with only a small teaser. Melissa begged and pleaded with numerous high school students who had stopped at The Burlington Place for their fill of candy, and eventually the Harrington's were recipients to one (only ONE!) of these sweet treats. 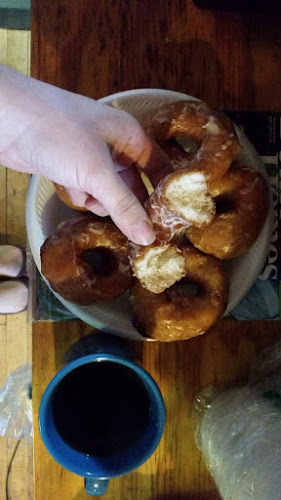 However, the youngest son of the ever-famed donut making family, assured Melissa at school the following week, that these home-made donuts should only be eaten fresh. This particular conversation lead to Melissa striking a deal that the next event which warranted the preparation of donuts, would be the ideal time to hold some fresh donuts aside and deliver promptly to The Burlingotn Place. So it was, on the evening of Friday, November 13th, a caller rang into The Burlington Place, asked for Mrs. Harrington and claimed to have some fresh donuts available. Payment required? A simple, one topping pizza. Could it be done? You bet your sweet tooth! Therefore, prior to some kind of crazy, unpredictable pizza rush on Friday the 13th, Mike and Melissa each devoured 3.5 home-made donuts, just the right amount to see them another TBP Friday night. This moment in history also marks a true coming-of-location, the creation of a root, the deepening of belonging, the truth of feeling as if one is truly a member of a long-standing community. Cheers to donuts that give you roots!